Whenever I am in Vientiane, I often make a visit to Gok Pho Market for an order of Lao green papaya salad. 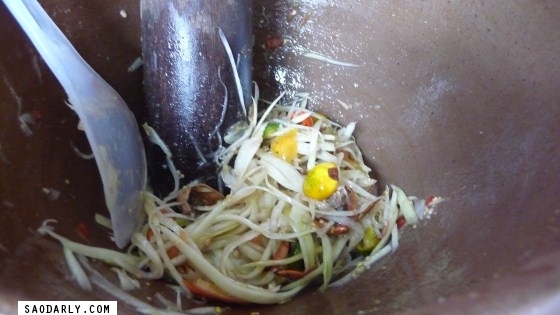 This papaya salad seller makes delicious batch of Tum Maak Houng, just the way I like it. I hope the next time I am in Laos she will still be in business. She was taking a month or two off the last time I was in Laos due to a surgery and she can’t stand all day anymore selling her papaya salad. Papaya salad is perfect with grilled chicken!